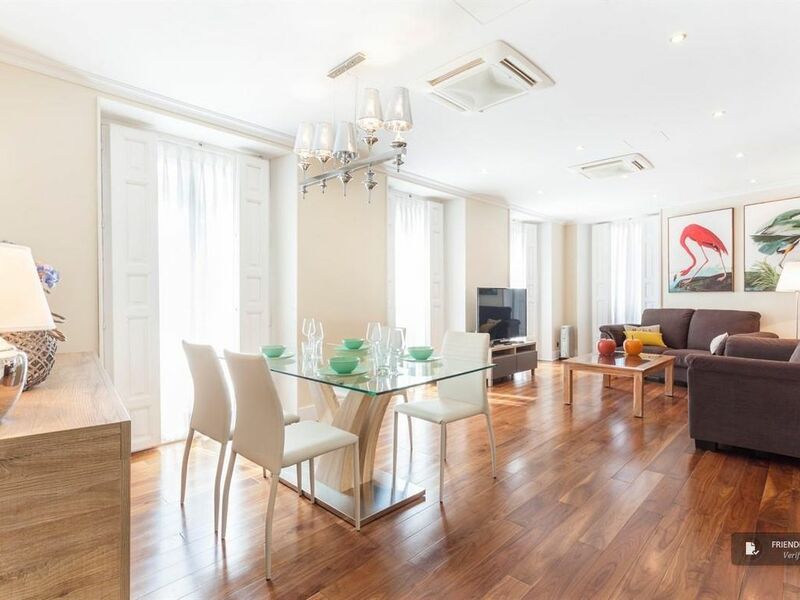 This apartment is just a few steps away from Plaza Mayor and Puerta del Sol, two of the most popular landmarks of Madrid, in a neighbourhood offering a great merge of historic heritage, cobblestone pedestrian streets, lovely squares bustling with visitors and traditional bars and restaurants. This 100m2 apartment is located on the 4th floor of a centrally-located building with a lift and can accommodate up to 6 people. Finished to the highest standards of quality, it’s equipped to provide its guests with the utmost in comfort. The apartment features three separate bedrooms and two bathrooms with shower. The master bedroom comes with a double bed and a private bathroom, the second bedroom has a double bed and the third bedroom is provided with two single beds. All of them are equipped with a wardrobe and have access to an outward-facing balcony allowing lots of natural light to stream in. The spacious living/dining room is just perfect: provided with large windows all around its walls, it enjoys a pleasant and very bright atmosphere. It comprises an area with two comfortable sofas and a dining area with a large table. The versatile kitchen comes fully equipped with everything you may need during your stay and so do the bathrooms. The apartment is provided with soundproof windows to guarantee a good night’s sleep. All bedrooms come with heating and air-conditioning.